Why should I visit a pain management clinic? Everyday Health also lists some of the healthcare professionals you’ll find at a pain clinic. Spine-Health.com also discusses the types of conditions best served at pain clinics. Once you’ve decided that a pain management clinic is right for you, there are a few steps you can take to get started on finding the best pain management doctors near you. Your insurance company may have different requirements for finding a doctor in your network. They may require a recommendation from your primary care doctor. Or, they could have a list of out of network and in network providers where you can start your search. Starting here — on the phone with an insurance consultant — is often your best bet for reducing a headache at the end of your search. Your primary care doctor likely already knows some of the symptoms and problems you’re experiencing. Talk to them to get more information about what could be causing your pain. If they think it’s appropriate, ask them to recommend pain management doctors you could try in your area. They can also steer you towards great pain management doctors or pain management clinics they’ve worked with in the past. Another important step may be talking to friends and family. Personal opinions are invaluable when finding the best pain management doctors near you. While online reviews or insurance company recommendations may be skewed, your friends or family have your best interests at heart. They can also be more telling when it comes to things like office environment and service, the pain management clinic cleanliness, and how quickly appointments can be scheduled. How are your pain management doctors trained? How do you treat my condition? Deciding on a pain management doctor is a big decision. You want a clinic that is prompt with answering questions and giving information or patient referrals when requested. If your call goes well, consider scheduling an appointment with a doctor to learn more about what they do and how they can help you. However, once you’ve found a pain management doctor that works for you, you’re also responsible for being your own patient advocate. How can you be the best advocate for yourself? Let’s take a look at five ways you can adopt a hands-on approach to your pain management. Pain management can feel like a full-time job. Tracking medicines and doctors’ appointments, researching new therapies to replace those that aren’t working, and all the other tasks associated with having a chronic medical condition can easily consume most of your time. You never asked for this job, and you probably wish you could quit. However, mastering the art of pain management is the best way to live your fullest life while feeling as good as possible. This title doesn’t necessarily come with a corner office, but it’s helpful to think of yourself as CEO of your health. You’re the boss when it comes to the medicines you take, the food you eat, and the lifestyle you live. No matter how amazing your pain management doctor is, he or she unfortunately can’t follow you home and make sure you stick to the advice. This is where you not only have to be a good boss, but also a good employee. The boss version of you will likely set lofty pain management goals like eating healthy, exercising, and researching new potential treatments. Then when it comes time for your employee self to follow out the orders, some resistance might ensue. That’s when the CEO comes in—that’s you—to remind yourself why this is important. It’s up to you to understand your condition and arrive at your pain management doctor appointments with questions in mind. Yes, doctors are the medical professionals and can help you feel better, but you know your own body the best, and you have the most at stake. Developing basic medical knowledge will also help you better understand your doctor. Nothing can replace an informed patient, and the more informed you are, the more likely you are to enjoy positive outcomes. There’s a lot of medical information out there, and unfortunately it can be difficult to understand. The best way to stay informed about your specific condition is to find an authoritative publication or website and read up, while continuing to check back every so often to track new developments. Resources include this blog, as well as websites like Arthritis Today and Pain Pathways. If you like science, consider checking Science Daily’s health and medicine news page. The website posts the latest research from universities around the world, and it’s written in a press release format, making it relatively easy to understand. Other reputable sources include WebMD, Harvard Health, and Mayo Clinic. Make the most out of visits to your pain management doctor by preparing beforehand. First, it helps to make a list of concerns you may have. This way, when you have the doctor’s ear, you’ll remember to ask about that sharp pain that’s new and seems to be unusual, for example, or any other concerns you may have. If something worries you, ask about it. It’s better to ask when you’re in the doctor’s office rather than start worrying once your return home. Second, have a list of any questions that have arisen since your last appointment. Feel free to ask for your pain doctor’s opinion on new research that affects your condition. You might gain good insight on an emerging treatment therapy or learn about things you should or shouldn’t do that will impact pain levels. If during conversations with your doctor, you don’t understand something, be sure to ask for clarification until the point becomes clear. Remember, you’re the CEO and need good information to move forward. Third, consider asking a relative or caregiver to join you for the appointment. It can be helpful to have a second ear because it’s hard to remember everything doctors say during appointments. You might also consider taking notes to help when memory fails. It may be helpful to keep the notes, questions, and research of interest in one place that’s easily accessible at home. Doctors can’t feel inside your body, so it’s important to be honest when they ask how much something hurts. If you brush something off, saying it doesn’t worry you when in reality it does, your doctor won’t be able to tell the true depths of your concern and could also brush it off. Alternatively, it’s important to be your own pain management advocate. If a pain management doctor tells you to wait on something that you feel is serious, pursue additional testing, even seeking a second opinion if necessary. Honesty about lifestyle choices is also critical, including the types of food you eat and divulging whether you smoke or drink. It’s important to have a doctor you feel comfortable talking with. Spilling the contents of your pantry isn’t about feeling embarrassed or ashamed. Doctors need to have all the information available so they can make the best decisions about your treatment. Omitted information can have serious health impacts. Some types of medications, for example, may be contraindicated for smokers. No matter what the truth, your doctor can handle it and your health will experience the benefit of honesty. Another thing to mention at doctor’s appointments is if you are having problems with accessing care. Are you having trouble affording medications or experiencing another barrier making life more difficult? Your doctor or the staff may be able to point you in the direction of an advocacy group or other resource to help. While it can be difficult to remember the timing of medications, or to push yourself to exercise, help is available. Try downloading an app that reminds you to take medications, for example. MedCoach is one option for iPhone users. Special features include the ability to connect with your pharmacy to request refills. MediSafe is available for Android users and offers many of the same features. For help improving your diet or adopting an exercise regimen, check out MyFitnessPal. The app allows you to track meals and activity levels. Pain management comes down to finding the best pain management doctors for you, AND being the best patient advocate you can be for yourself. Both of these combined can help you reduce your pain levels and achieve a better quality of life. It’s not easy, but the first step starts now. Follow the steps above to find pain management doctors near you, or click the button below to look through the list of PainDoctor.com certified pain specialists. Hi Lisa — You may be able to find a doctor in your area here: https://paindoctor.com/get-relief-now/. Hope that helps! I am trying to find a chronic pain mngt Dr in the northern NJ area. My husband has been through multiple surgeries, rehabilitation centers, physical therapy, etc. After 12 years of this we have a system that he can live with. But I cannot seem to find a Dr who will just continue his current pain medication regimen. Where can I find one. Please help! Hi Renee — We are so sorry about the challenges you’ve had. We don’t work directly with any specialists in that area. You could also contact one of the nearest listed docs in our map search and contact them for recommendations near you. Hope that helps! Hi Travis — We absolutely recommend reaching out to a pain specialist since you’re having more advanced pain symptoms. I am so upset with my pain management dr..he hates the medications im on.he never looked at my rotaor cuff injury or the pics of the injuries an4 surgerues….the pain meds i had were helping with my injury which was a bad one..my pain dr bfore got in some trouble an wasnt allowed to perscribe anymore…now this dr wants ti do an injection an therepy 3xs a week..this injury is 10 yrs old. I have been through all the physical therepys .i couldnt complete them as the pain was so bad ..i have had injections and different meds an have gone through every other treatments. Now he is pushing me toward a shpulder replacement an i dont want to have this at this time….i cant get throughh pain on my regular days without adding therepy to it..i dont no what to do. I am looking for a Dr .I did find one but it almost in Mississippi.and that is to far . I have to change doctors because of insurance change. I’m 69, have had migraines since childhood, now suffer from severe arthritis, fibromyalgia, stenosis, bulging discs, sciatica and neuropathy. After years of trying all sorts of procedures my primary care physician has put me on oxycodone and fentanyl patch and it has given me a new lease on life. I also have Hepatitis C so am limited to what medications I can take. If I stop my meds my blood pressure skyrocket. I’m looking for another doctor but I’m terrified of stopping my meds suddenly which will happen if I run out. I’ve had to do that several times and the last time almost killed me. I hope to find someone but they refuse to discuss meds on the phone. All I want to know is if they can prescribe if I need it but people get very hostile on the phone and accuse me of trying to sell drugs or get high when all I’m looking for is some quality of life. Hi Lana — We are so sorry to hear about the challenges you’ve been facing. Unfortunately we can’t answer directly recommend docs online without knowing more about your condition. You can find Pain Doctor affiliated specialists here: https://paindoctor.com/get-relief-now/ or use the tips here to find one near you. I am having a difficult time finding a primary physician as well as a pain management specialist to help me with chronic pain. I have a rare disorder, (Hydradinitis Supperiva). Can you recommend someone please? Hi there — Unfortunately we can’t answer directly recommend docs online without knowing more about your condition. You can find Pain Doctor affiliated specialists here: https://paindoctor.com/get-relief-now/ or use the tips here to find one near you. I am seeing a pain doctor in Texas. I have 9 bulging and collapsed/leaking disc. I have had a fusion in my lower back and 2 in my neck. My insurance referred me to the Mayo clinic over 1000 miles away. I went and the neurosurgeon at the Mayo clinic saw me, he had a group of doctors look at my records, MRI and cat scans and said I need to see another pain Doctor because I was being under-treated. After 25 years of taking Hydrocodone as prescribed my PMD changed me to 3 a day Tylenol#4. I took the referral that I got from the Mayo clinic to a PMD locally and dropped all the paperwork off with MRI readings. I get a call 2 days later and was told he can’t see me. I started calling other PMD office and they all are saying they are not taking Pain Patients that require medication. I haven’t went back to my PMD yet and let him know what the Mayo clinic said and afraid if I do he may get mad at me and abandon me as a patient. What can I do at this point besides suffering in treatable pain? I’m so depressed just thinking this is how I’m going to suffer the rest of my life and I’m only 57 years old. Hi John — All doctors know sometimes you need a second opinion. Talk openly with your PMD about the findings from Mayo and for information about more help they can provide. Thank you for all of this wonderful information. I think I will call my pcp tomorrow. I truly hope they can work with me. I have dealt with this pain for too long and I’m sick of trying to be strong all of the time. Thanks for your kind words Matthew. Wishing you luck and much healing on your journey to finding a pain specialist. It says schedule your appointment but it does not have and option for Florida why?? I need a doctor who will listen to me and help me come to a decision about what could be done about my situation because its getting worse. Please help me!! Hi Rhonda — we are so sorry about this. For right now, we have a limited geographic range where we can match patients to doctors, because we can’t certify standards for other state’s clinics. We encourage you to use the tips in this post (other review sites, for example) to find one near you. Hi Nancy — We encourage you to use the tips here to find one. Hello To Whom It May Concern, I’m currently going to my PCP and I Have had Big Trouble with my blood test and blood pressure now I’m 58 yrs old. I’ve had 5 foot surgeries and then a C 4 & 5 dislocated disks and degenerative disks spinal stenosis and it was pressing on my nerve I had no use of my right arm.My blood pressure was so high from the pain, my neck and foot still hurts today. But actually why I’m writing is because my liver enzymes are at a high level, I’ve been to a GI dr. I have a regular GI dr but I just found out she died, I had been going there 10 yrs. cause my mom died from colon cancer. My right side hurts so bad I can hardly get up from an seating position and I can not do my daily chores. My pcp gave me some meds w/o acetaminophen b/c of my Liver problems and I’ve never drank achahol. But my pcp no more of any kind of meds with acetaminophen in it, he wrote me a script for OxyContin 5 mg with no acetaminophen in it. But he says he cannot continue to write the scrip. And I don’t have a diagnosis on my side stomach. I’m in so much pain. Please lead me in the right direction. Thank you, Cathy B.
Hi Cathy — We are so sorry to hear about the challenges you’ve been facing. Unfortunately we can’t answer specific medical questions online. You can find Pain Doctor affiliated specialists here: https://paindoctor.com/get-relief-now/ or use the tips here to find one near you. We also recommend reaching out to a support group to get help from people who understand what you’re going through. 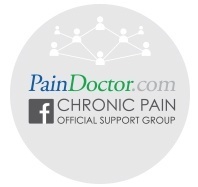 You can find online options here: https://paindoctor.com/chronic-pain-support-groups/. I need a pain doctor in the Port Huron area I have sever spine issues and a failed back surgery I need help NOW I don’t know how much longer I can take this pain I had 2 injections at Harper Hospital and now the doctor that sent me there isn’t listed, please help I am going to lose my mind. Hi Wanda — We are so sorry to hear about the challenges you’ve been facing. Unfortunately we can’t answer questions online without knowing more about your condition. You can find Pain Doctor affiliated specialists here: https://paindoctor.com/get-relief-now/ or use the tips here to find one near you who can help. Hi my name’s Rick I was I was in a car accident in June 2017 I have a couple of lawyers working on it for me in a result I just had major back surgery in January I had interbody Fusion six screws and rods and L4 L5 S1 and I’m in so much pain my surgeon said he can’t prescribe me meds that I have to go to a pain management doctor. Also my left leg I just found out I have arthritis in my left hip which makes my left leg not work I can’t walk basically permanently disabled I live in the Pompano area Florida and I know the laws are changing it’s not that I want pain medication instead I actually need it and it really stinks that people out there ruined it for people that really need it what can I do that’s close to me my area please help thanks. Hi Richard — We are so sorry to hear about the challenges you’ve been facing. Unfortunately we can’t answer questions online without knowing more about your condition. You can find Pain Doctor affiliated specialists here: https://paindoctor.com/get-relief-now/ or use the tips here to find one near you who can help. Just moved to colorado and am having trouble finding a pain management doctor that prescribes the medication i have been on. It is an opioid so i know its hard to do anyway but i have been out of my medication for almost a week. Hi Patti — We are so sorry to hear about the challenges you’ve been facing. Unfortunately we can’t answer questions online without knowing more about your condition. You can find Pain Doctor affiliated specialists here: https://paindoctor.com/get-relief-now/ or use the tips here to find one near you who can help. Hi Nicholas — We are so sorry to hear about the challenges you’ve been facing, but unfortunately we can’t answer specific medical questions on the blog. If you do want a second opinion, you can find a doctor in your area: https://paindoctor.com/get-relief-now/ or use the tips here to find one: https://paindoctor.com/pain-management-doctors/. I am looking for a pain manage Dr in Warminster who would be willing to take Wyoming workmans comp. Would like to stay on pretty much same meds and treatment I’m on with my current pain management dr.
Hi Laura — You can find Pain Doctor affiliated specialists here: https://paindoctor.com/get-relief-now/ or use the tips here to find one near you who can help. Hi Scott — We are so sorry to hear about the challenges you’ve been facing, but unfortunately we can’t answer specific medical questions on the blog. If you do want a second opinion, you can find a doctor in your area: https://paindoctor.com/get-relief-now/ or use the tips here to find one: https://paindoctor.com/pain-management-doctors/. We also recommend reaching out to a therapist for help with the very real effects chronic pain has on mental health. They may also be able to help you look for doctors in your area too. We have a list of cheap or free therapy options you can use here: https://paindoctor.com/free-therapy-online/. Sending healing and warmth your way. I was taking Mobic for arthritis, had to stop taking it and NSAIDS do to kidney disease. Liver enzymes elevated so Tylenol is out. No physician will prescribe anything else for pain. I am miserable! Not asking for narcotics because they knock me out. With the new regulations physicians refuse to even write Tramadol. I see pain management as “spinal injections.” Can a pain management help me with my horrible arthritic pain in my neck and back? No spinal injections don’t want anyone messing with my spine. Massages make pain worse. After a year in my new home I decided it was time to try to switch PMD. I tried the advice you give about calling the office and then seeing the Dr. to make sure they can treat you. Guess what now my original Dr. won’t see me, even though I thought the PA and I had an agreement they would continue. Also the staff at the two offices in the new area are taken aback that I would want to interview a new Dr. I refused medication from the two Drs. at the consultations. How are you supposed to avoid being labeled a drug seeker but find a PMD you perfer? Hi. I am constantly in pain and I was sent to a pain clinic a while back. They put me on 2.5 mg Suboxone. I took half of it in the morning and half in the evening. I was miserable and started feeling weird. The next day I took a whole one in the morning. Although I am on other medication, I stopped taking them 2 weeks before. The second day, I could only say was that I didn’t feel good, when my husband got home about 5:00. He took me to the ER and they gave me some narcan and I passed out for about 4 hours. Narcan always puts me to sleep immediately. For the first couple days I couldn’t speak…I didn’t recognize anything such as words or colors. I didn’t know anyone or what things were. In the evening of the third day, I started coming around… Kinda. The next day I came to completely and no one knew what happened to me. They weren’t sure if I would ever come around the day before. Can that be an allergic reaction to Suboxone? What about the Narcan? The doctors told me that they had never seen a reaction like that. Should I report it to the company that makes the products or do you think it was a fluke? Please help me understand!!! Hi Cindy — We are so sorry to hear about the challenges you’ve been facing. Unfortunately we can’t answer questions online without knowing more about your condition. You can find Pain Doctor affiliated specialists here: https://paindoctor.com/get-relief-now/ or use the tips here to find one near you who can help. I need a dr out here so I can continue to get my meds. I was injured on the job that I worked at for 23 years and currently on SS disability I have all my MRI’s and saved my empty med jars. Hi Hank — You can find Pain Doctor affiliated specialists here: https://paindoctor.com/get-relief-now/ or use the tips here to find one near you who can help.